This weather has been reaching havoc on my skin. With the extra cold days still lingering, but the humidity creeping up (so much rain! ), my skin is having a hard time finding a balance. It's slick and oily one day and then flaky and dry the next! My usual face wash and moisturizer routine hasn't been doing all the work. I've turned to some of my favorite face masks to help. I love a good facial as much as the next girl but I'm super picky. I'm always hypersensitive to the products they are choosing to use because I feel like my skin does not like to be introduced to new things. But, let's be real. I do not have the time or money to be getting a weekly facial right now. 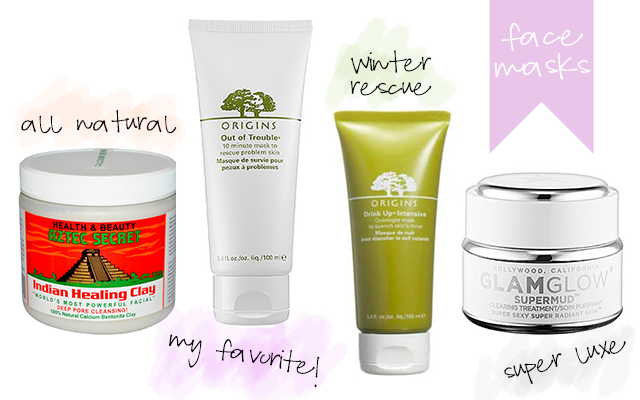 Enter face masks - the at-home spa! This baby is every beauty bloggers best kept secret. This Bentonite clay is mixed with apple cider vinegar to make a delicious green paste. You layer it on thick and leave it for up to 30 minutes depending on your skin. Within seconds, you'll feel your skin start to pulsate and tingle! Magic is happening! The clay draws all the impurities out of your skin while the apple cider vinegar acts as an antiseptic making sure none of that gunk goes back in. When I wash if off, my skin is a little red but it goes away within minutes. It's sooooo soft and smooth. Kind of amazing. The huge tub of clay is only $8 and you can find all-natural Bragg's apple cider vinegar at stores like Whole Foods (this is the only ACV they recommend using on your skin). Full disclosure, I got this mask as part of a set last time I refilled my moisturizer. I probably never would have picked it up because I typically shy away from anything that is super moisturizing since that's typically what I'm trying to avoid. However, like I said, this winter has been harsh and my skin was in all sorts of states. I found myself reaching for this mask once a week and would wake up with baby smooth and soft skin that wasn't broken out at all. I use a Clarisonic daily and while it's great for sloughing off rough skin, sometimes I need a little extra moisture. This mask does the trick. It's hardly a mask though since you just put it on like lotion and sleep the night away. This baby is a showstopper. And to be honest, I haven't even tried it yet. However, literally every single blog, beauty website, magazine...has been talking about Glam Glow. I've heard only amazing things about this cleaning treatment and I'm just waiting for the right time to take the plunge. A 1.2oz container comes in at $70 which is basically the cost of a facial. But I mean, I'll get more uses out of this, right? I recently found it on Amazon and it didn't look sketchy (aka the seller had 5 stars) and it's only $40 sooooooo this might just have been the push I needed to purchase!